I found a cartoon on twitter by Tom Gauld…. This is exactly what is happening to my characters now. They are changing entirely. Women into men, children into women, men into monsters. The plot is not a straight line and neither are the characters. The material you thought you didn’t need and had rewritten comes back in different forms. Writing is becoming more and more about rewriting. It’s very hard to explain and best to leave confined to the mysterious word-process. I wonder at the tutorials and videos and how-tos of writing a book. Even if you write down verbatim that your plot will be such and such and your characters will be so and so, when you combine them on the page they scurry off like ants in different directions. Did you here about Donald? Reining them in, exactly, how hard a task this is! 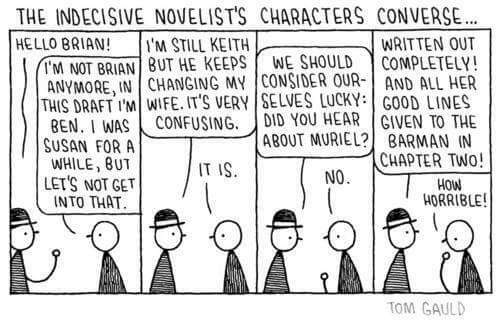 The cartoon gives me an idea of the characters in a book draft getting together to take the writer in hand. Yes, Simon….characters take over once the writing hurdles stop. Tom Gauld’s literary cartoons are a treasure! Next Does Editing Change the Way you Write?